Show large images only, if printing across many pages. Use the search form above to find a design. Click on an image in the results. Save it to your Desktop. That will make it easier to find. If you explore a site for another image, make sure to download the most detailed copy of the design to get the best printout. 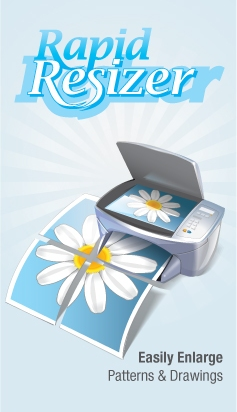 Get your file into Rapid Resizer. If you get too few results, try using fewer words. For example, search for santa instead of santa claus pattern. If a picture is not only for personal use, ensure that the owner's license permits how you plan to use it. I'm not responsible for the content of any of the sites listed. Take the usual caution when browsing random websites.